Computers are an essential element to both our personal and work lives. Our reliance on computer technology makes it so that hardware and software maintenance must be done on a regular basis. Building a server, workstation, or personal PC is becoming a popular option verse purchasing a pre-built PC simply because end users can fully customize their new machines without an exceedingly wild budget. Having a computer built allows you to select and purchase the components of a PC separately. For servers and workstations being able to customize components is critical. Custom built computers are often less expensive and better performing than pre-built, higher priced computers. Although price is usually the first thing that consumers care about when it comes to building the technology for your company it should not be the most important factor. It is crucial to work directly with IT consultants that are familiar with how your company runs, the software that is needed, and hardware requirements when purchasing and building the technology that will be used to help run your company. 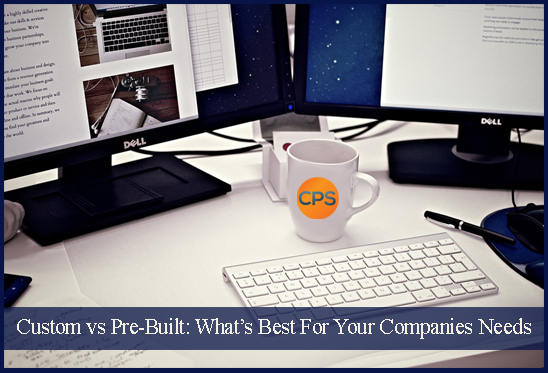 Specific software systems only run using operating systems that meet their precise needs. The last thing you want to do is to customize a computer that will not run the most basic of software programs used daily in your operations. An IT professional can help to make sure the computers that are built use the appropriate motherboard, graphic card, and RAM for your needs while ensuring room to grow as technology is updated in the future. Not only is price a huge benefit of custom-built servers and workstations so is the flexibility in regard to the unit’s specifications. With the ability to purchase components according to the user, each computer can be built to meet the specific needs of the users. The function of the computer is different depending on the user. Certain workstations need to function with specific software systems crucial for day to day business operations and therefore will need to ensure the computer is built to meet this need. Some considerations that need to be considered are word-processing functions, audio-visual features, and gaming abilities. Let’s face it, there is no need to spend extra on a fancy gaming video card to be installed on a workstation where graphics and gaming are not a priority. Instead a less expensive, entry-level, card can be installed. Although many times a pre-built computer will work just find for most situations however, when you can save yourself money and purchase a pc that is customized to your needs, why wouldn’t you? Working with professionals you can work together to ensure that your network is set up for the most optimal results for your company and industry. This also helps to ensure that your technology can keep up with your company’s future technology needs. PC’s don’t need to be replaced on a yearly basis to enjoy the latest in technology. A few basic upgrades in hardware and software as needed, on a regular basis, can save company’s thousands of dollars each year without sacrificing on technology.